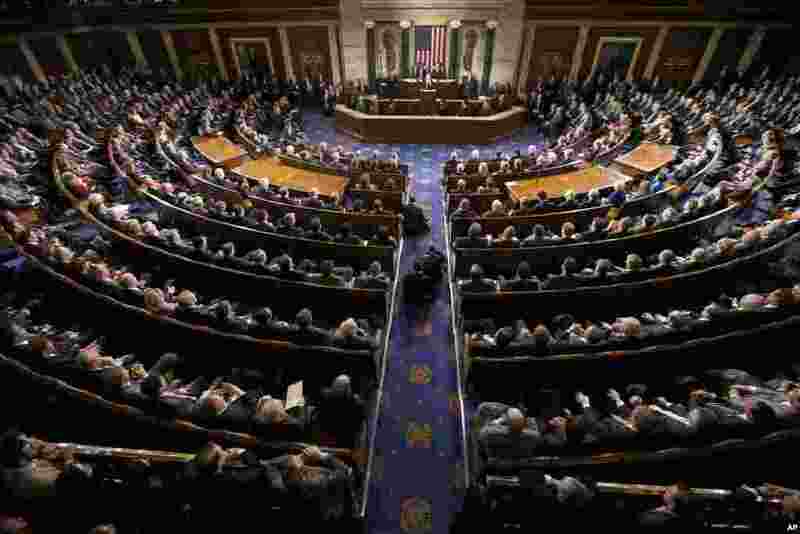 Israeli Prime Minister Benjamin Netanyahu said he felt a "profound obligation to speak" to U.S. Congress members Tuesday about an issue that could threaten the survival of his country: Iran's quest for nuclear weapons. 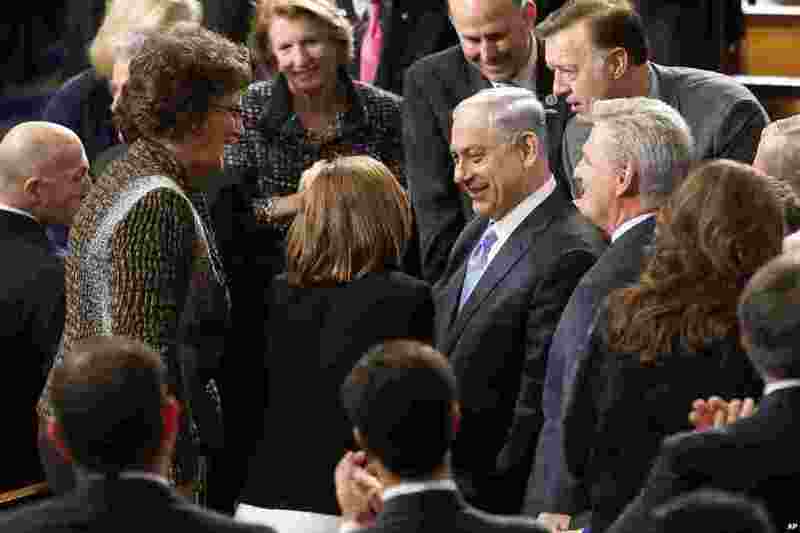 1 Israeli Prime Minister Benjamin Netanyahu, accompanied by House Majority Leader Kevin McCarthy of California, is greeted as he walks down the aisle before addressing a joint meeting of Congress on Capitol Hill in Washington, March 3, 2015. 2 Israeli Prime Minister Benjamin Netanyahu speaks before a joint meeting of Congress on Capitol Hill in Washington, March 3, 2015. 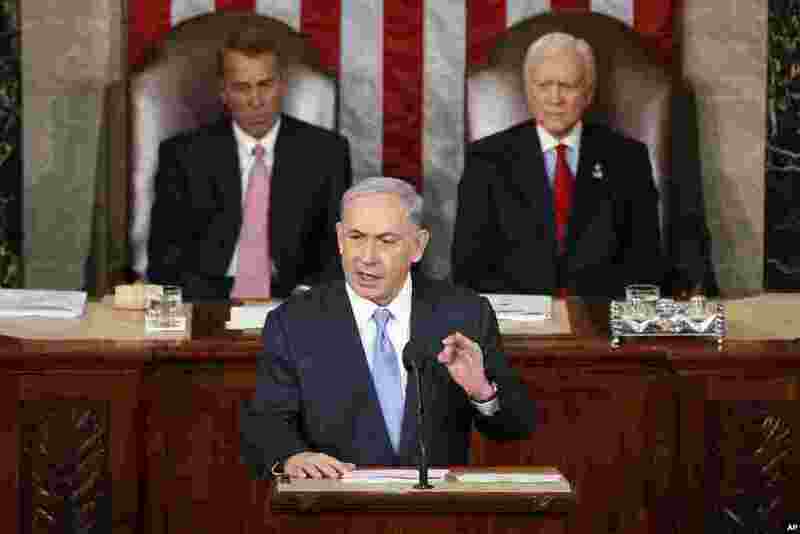 3 Israeli Prime Minister Benjamin Netanyahu speaks before a joint meeting of Congress thanking the U.S. and President Barack Obama for aiding Israel while warning of the threat that Iran poses to Israel's survival, Capitol Hill in Washington, March 3, 2015. 4 Sara Netanyahu, wife of Israeli Primine Minister Benjamin Netanyahu, waves as she sits next to Holocaust survivor and writer Elie Wiesel in the House Chamber prior to Prime Minister Netanyahu's address to a joint meeting of Congress in the House Chamber, Capitol Hill, Washington, March 3, 2015. 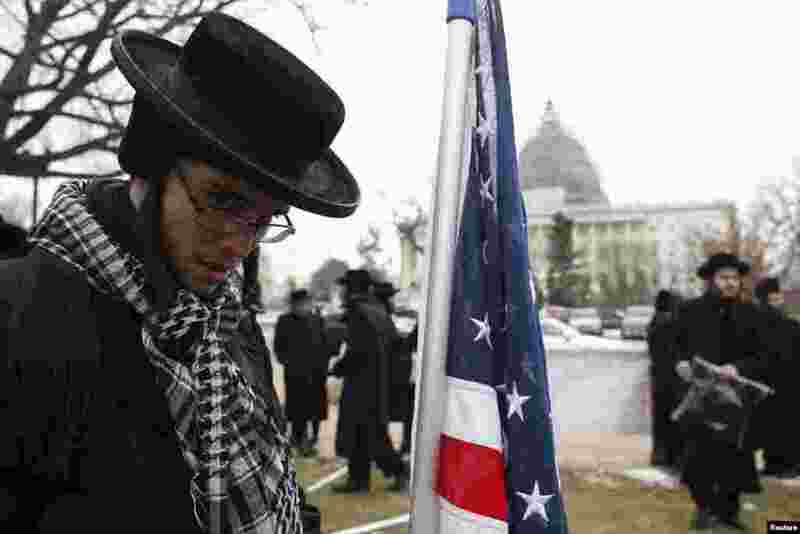 5 An anti-Zionist Orthodox rabbi is pictured next to a U.S. flag during a protest against Israeli Prime Minister Benjamin Netanyahu's speech to a joint meeting of Congress on Capitol Hill in Washington, March 3, 2015. 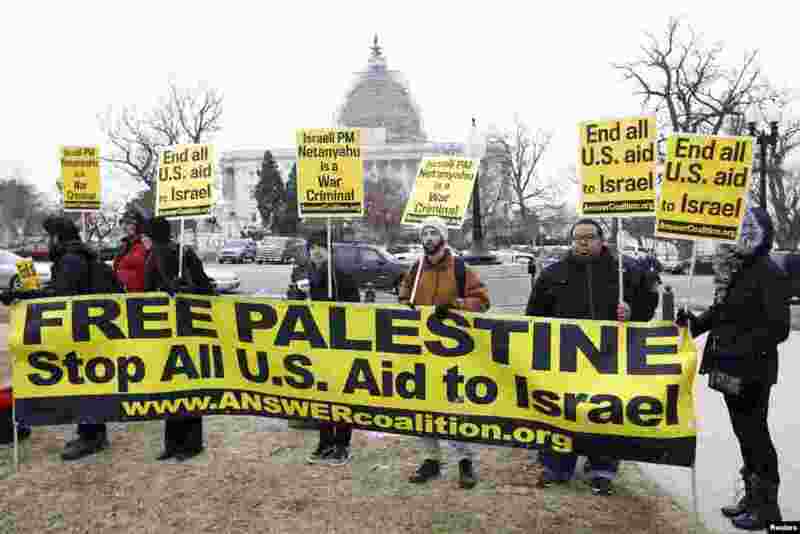 6 ANSWER Coalition activists demonstrate against Israeli Prime Minister Benjamin Netanyahu on Capitol Hill in Washington, March 3, 2015. 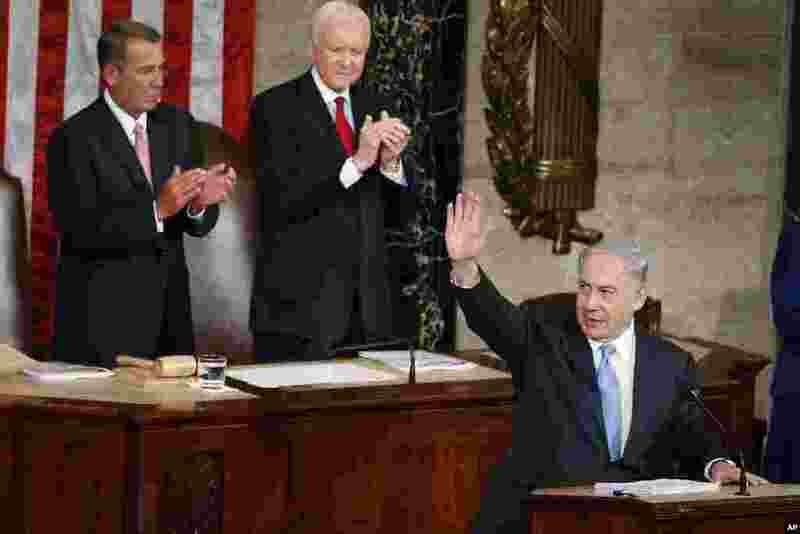 7 Israeli Prime Minister Benjamin Netanyahu waves as he steps to the podium prior to speaking before a joint meeting of Congress on Capitol Hill in Washington, March 3, 2015.